It's Valentines day tomorrow and I don't think I know many people who actually love Valentines day (apart from my friend Dani who once gave out little Thorntons chocolate hearts to everyone in our seminar at uni!) A lot of people dread it because they haven't got a 'date' and a lot of couples don't enjoy the whole mushy teddy bears and lovey dovey cards thing so I've found it's usually not a day many people look forward to. Although in recent years I've found myself liking it not because of my boyfriend (sorry Craig) but because of everything that surrounds it. Valentines Fashion, Valentines Make-up, Valentines Food and Alcohol, Valentines Television! All the things I like right there so what's not to look forward to! So who cares if you've got someone to spend it with or not, Enjoy all that the commercialisation of Valentines day has to offer! And if you really hate it then don't worry, Easter is soon and you can stuff your face with chocolate. 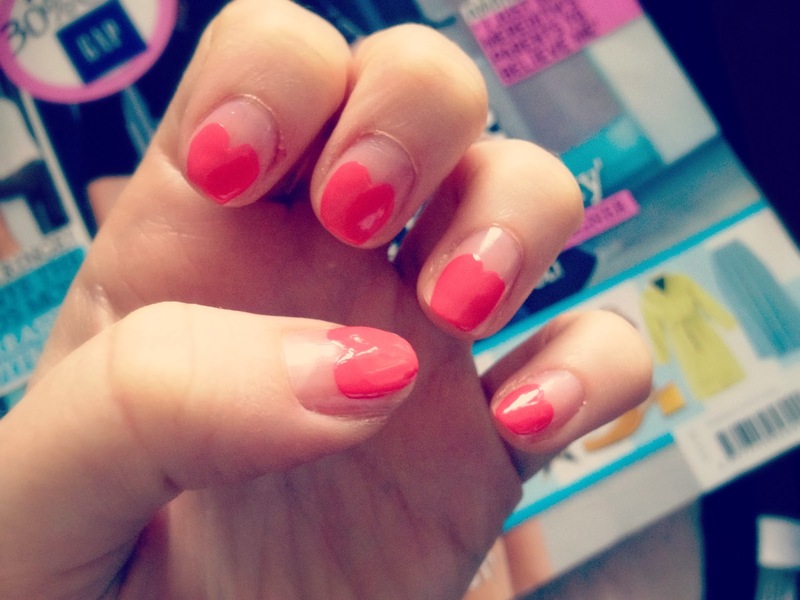 I thought I'd contribute to the Valentines nail art I've seen taking over Instagram and show you mine! 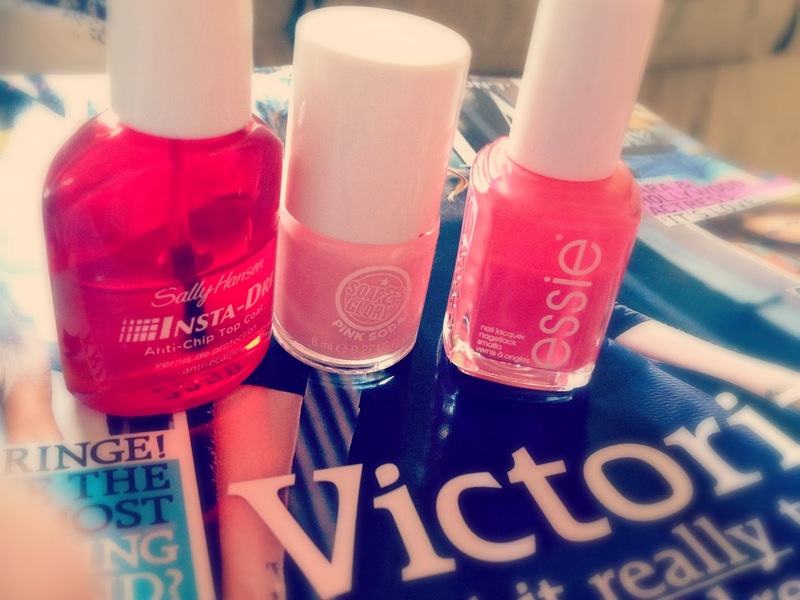 I love this shade of pink by Essie called Cute as a Button. This was super easy to do as well because the nail polish brush is rounded at the end, so I did a diagonal left sweep and a diagonal right sweep and it was done! This look may be improved if my nails were more pointy or even rounder but hey ho what you do. I used Soap and Glory Pink Soda for the base (Which I got in this set that is now out of stock but you can use any pinky base) and sealed it with Sally Hansen Insta-dry Topcoat. 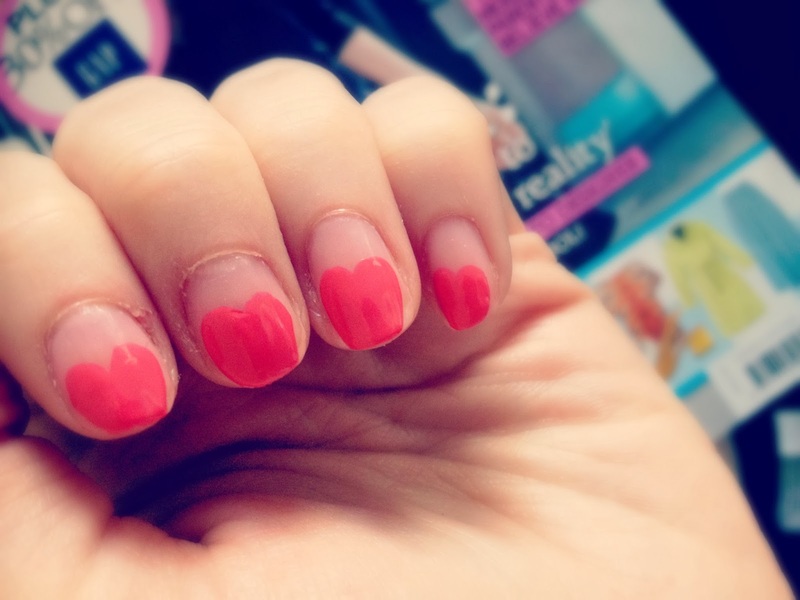 If you've created any Valentines themed nail art do link me to it here or on twitter (georgiabeeee) or Instagram (xgeorgia) I'd love to see it! What's your fave or least fave thing about Valentines day? What are you getting up to tomorrow? or you could click here to see what I was loving for Valentines last year!